Nicki Hilliard, Pharm.D., holds her Outstanding Woman Faculty Award and stands with Rachel McCaleb, who nominated her for the honor. 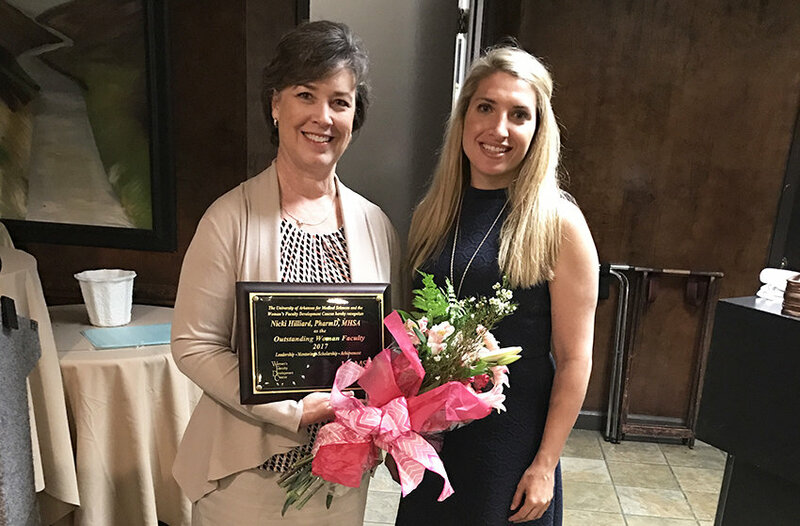 April 25, 2017 | April 25, 2017 | Nicki Hilliard, Pharm.D., a pharmacy professor at the University of Arkansas for Medical Sciences (UAMS), recently was honored with the 2017 Outstanding Woman Faculty Award by the UAMS Women’s Faculty Development Caucus. Hilliard is a professor in the UAMS College of Pharmacy Department of Pharmacy Practice. The award is given to a woman who is a mentor and role model with a record of scholarly endeavors, teaching expertise and strong leadership as demonstrated by administrative skills and professional accomplishments. Recipients also have a history of helping develop careers for other women. Hilliard is president-elect of the American Pharmacists Association (APhA). Hilliard will spend a year in that office, and in spring 2018, she will become the association’s president. In 2019, Hilliard will become past-president. The APhA has more than 65,000 members nationwide. Her nomination letter also cited her establishment of Nuclear Education Online, providing education to health care providers engaged in nuclear medicine worldwide;mentoring of junior faculty members; and numerous national and state awards for her work in health care and education. Other 2017 nominees for the award were: Claudia J. Beverly, Ph.D., R.N., director of the Hartford Center of Geriatric Nursing at the UAMS College of Nursing and director of the Arkansas Aging Initiative at the UAMS Donald W. Reynolds Institute on Aging; Elisabet Borsheim, Ph.D., an associate professor in the UAMS College of Medicine’s Department of Pediatrics and Department of Geriatrics; Charlotte Hobbs, M,D., Ph.D., executive associate dean for research in the UAMS College of Medicine; and Martha Phillips, Ph.D., M.P.H., M.B.A., associate professor in the UAMS College of Public Health Department of Epidemiology.